Pioneered over 35 years ago, this adventurous 10 day trip visits Egypt's most famous sites, including the Pyramids at Giza; the oldest of the Seven Wonders of the Ancient World. 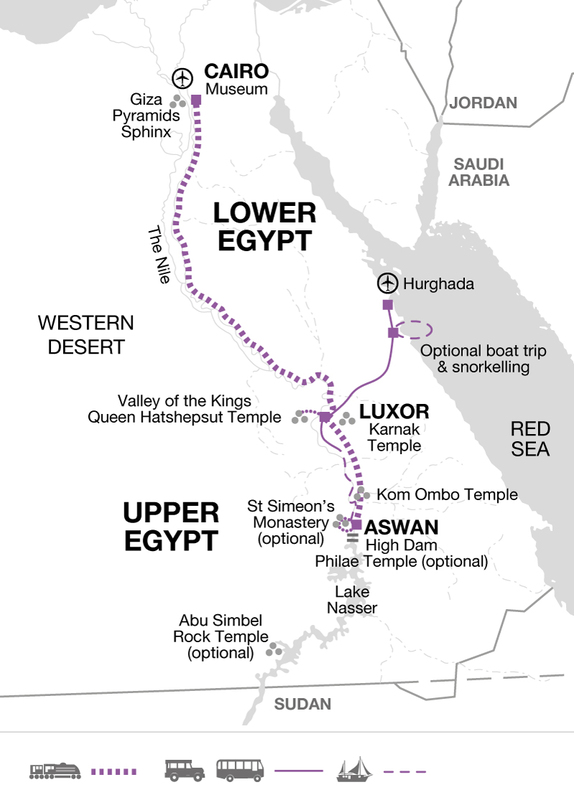 An overnight train journey will be followed by sightseeing in Aswan before spending time sailing along the lifeline of the country; The Nile River. Travelling upriver in traditional, lateen-rigged feluccas, the experience will be a chance to unwind whilst watching the daily life that occurs on the river banks and to escape from normality by sleeping out on deck under a starlit sky. After time exploring Luxor's Valley of the Kings, travel to Safaga for three of relaxtion and sunshine by the azure waters of the Red Sea. Arrive in Cairo and check-in at our hotel. As flights will be arriving throughout the day, the official welcome meeting will take place on the morning of day two but your Explore Leader will be around to greet you and help with any queries this evening. The rest of the day will be spent on the felucca, with occasional stops to visit small riverside communities or for a swim to cool off. Each day, timings will be flexible depending on the current of the river, so your Explore Leader will give regular information. This trip makes use of simple accommodation throughout. Our hotels in Cairo and Aswan are both centrally located in the busier urban areas and shops, restaurants and some attractions are easily accessible on foot. While in Luxor we will be staying on the quieter side of the river in a family-run hotel, with a pool and a rooftop restaurant with views over the Nile, to make the most of the nearby location to the historic sites. Our hotel in Safaga is larger resort style hotel of a premium grade. The hotel has excellent facilities, including a bar and a pool with direct access to the beach. As well as a chance to see Egypt's world-famous highlights, including the pyramids and Valley of the Kings, a three night felucca sailing is an opportunity to experience the other Egypt: the quieter, more traditional and natural side. Be rocked to sleep by the river and woken by the sunrise, and spend the time between reading and taking in the views. Explore the ancient sites of Luxor before a four-day extension on the Red Sea Coast to relax, snorkel and make the most of the tropical beaches.